With its robust and diverse portfolio of LDOs, power modules, DC/DC switchers, and PMICs, TI combines easy-to-use solutions with system expertise to help you find the perfect power supply match for your processor or FPGA. 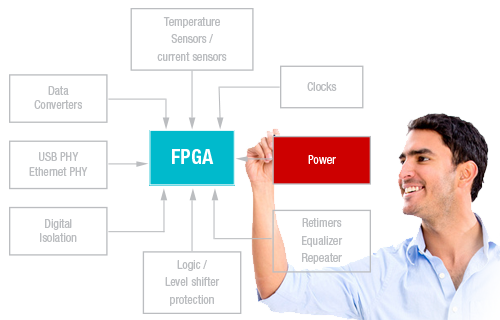 What type of processor or FPGA are you powering? This site features power supply suggestions for the following families of Texas Instruments processors: Sitara™, MSP430™, OMAP, C6000, and more. Xilinx® FPGAs discussed on this site include: Kintex® UltraScale™, Virtex® UltraScale™, Virtex®-7, Kintex®-7, Artix®-7, Spartan®-6, Zynq® Ultrascale+™ MPSoC, the Zynq®-7000 Extensible Processing Platform (EPP), and more. The Altera® product portfolio includes the following FPGA series: Stratix®, Cyclone®, Arria®, MAX®. The NXP®/Freescale™ product portfolio includes the following processor families: i.MX6S, i.MX6DL, i.MX53, Kinetis, QorlQ®. The Intel® CPU product portfolio discussed within this site includes the following processor families: Broadwell, Denverton, SkyLake, IceLake, CoffeeLake, Avoton, Rangeley, Braswell, and Baytrail. This tab includes power supply suggestions for the following processor vendors: Broadcom®, Cavium™, Barefoot, and Innovium™. Take your FPGA or processor power supply design to the next level with WEBENCH. Generate system-level schematics and performance estimates with the one and only Power Architect tool.